Explore lo mejor de Colonia en este recorrido en autobús de dos pisos narrado, con paradas y subidas y bajadas. Visite muchas de las principales atracciones de Colonia, como la Catedral de Colonia y el Ayuntamiento de Colonia, y visite el casco antiguo, la bulliciosa Roncalliplatz, la histórica plaza Alter Markt y mucho más. Seleccione el pase de 1 día, luego suba a bordo en cualquiera de las 16 paradas y conozca este hito de la arquitectura gótica alta en forma personalizada, con comentarios en vivo a bordo en inglés y alemán. Audio guías en nueve idiomas también disponibles. Incluye 1 hora de crucero por el río Rin. Los tours salieron a tiempo y el servicio fue muy bueno. El crucero por el río podría ser un poco más largo. Mala época para visitar Colonia, lluvias y no se pudo realizar el paseo por las ciudades del Rhin. octubre Lo que más se destaca en Colonia es su grandísima Catedral. Valió la pena el viaje solo por este monumento histórico. The bus tour was OK...finding the stops can be a little confusing. They are not the regular bus stops but the representative didn't give much instruction on what to look for. The buses only come every 30 minutes, so we waited quite a bit. One one bus, the commentary was only in German and my headset didn't work, but another bus had a much better guide who spoke German and English. Once on the bus, it takes you to most major landmarks and attractions you would want to visit. The river cruise made up for the shortcomings of the bus tour. We enjoyed it very much and also had commentary. Overall, I would recommend this experience. A must do tour when you are in Cologne. If you do not get on at stop one you do not hear you are to tell the driver what stop you want to get off. Not that that matters if you only speak English! If you expect to be right near the sites when you get off a stop, sorry only three stops are near the attractions. At one stop I had to walk 20 minutes. Good way to see the City. Too bad the head phones were working well. 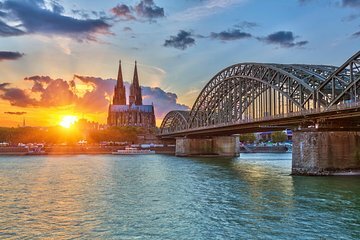 We missed our free Viking port tour so this tour was the only introduction to Cologne we had. We really enjoyed the boat tour...we were 3 minutes late trying to find the pier so they held the boat for us - thank you. The tour about the city was excellent. We saw the main sights, and we enjoyed the comentary. It was okay. Hop on Hop off bus was okay. It's very hard to hear since the loud speaker was talking in German very loud and headphone was not very helpful. Boat ride was okay. Confortable, no announcement, just sightseeing. Only thing I found in Cologne interesting was Cathedral. Not much to see in Cologne. The cruise was lovely, well done and the narration was excellent - in English and in German. I was interested to see so many German tourists as well as people from all parts of the world taking this cruise. The hop-On Hop-Off bus tour - the first bus was excellent and the gal that did the narrating was excellent as well as the bus driver, The last bus driver - did not speak English, had a taped narration and was a bit crude since he did not know English. Plus he was late getting there.